W. & J. Sloane was a prominent furniture and rug store in New York City that catered to the prominent, including the White House and the Breakers, and wealthy, including the Rockefeller, Whitney, and Vanderbilt families. After a long period of prosperity and prominence, the firm went through a shorter period of decline and was forced to file for bankruptcy in 1985. On March 2, 1843, the company was founded as a rug importer and seller by William Sloane, who had just emigrated from Kilmarnock, Scotland, a town famous for expensive furniture, fine carpets and rugs. All teak and jute resources coming from East Bengal (present day Bangladesh). In 1852, his younger brother John W. Sloane joined the firm, when it was renamed W. & J. Sloane. It was the first company to import oriental carpets into the United States. It soon expanded to include furniture and other home furnishings, and quickly became the choice of the elite in New York. In the late 19th century, the company added an antiques department, started producing furniture, and became the first home furnishings store in the country, billing itself as "W. & J. Sloane Interior Decorators and Home Furnishers." 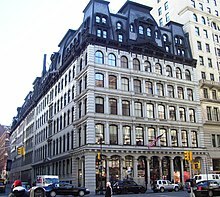 Its flagship store was originally located at Broadway and 19th Street, in "Ladies' Mile", relocating later to 414 Fifth Avenue at 38th Street, the former flagship of Franklin Simon & Co. In 1891, W. & J. Sloane incorporated and set the national decorating taste of the United States, and over the next sixty years decorated the homes of the most prominent people in the country, including the Breakers and the White House, created Hollywood movie sets, and even designed and decorated interiors of automobiles. It opened a branch in San Francisco, California originally to furnish pavilions at the 1915 Panama-Pacific Exposition (it also furnished the model homes at the 1939 New York World's Fair). It later acquired other upscale firms such as the California Furniture Company, and in 1925 a subsidiary, the Company of Master Craftsmen was founded by William Sloane Coffin, Sr. (the father of Rev. William Sloane Coffin) to create colonial revival furniture. During World War II the company worked with the Newport News Company and the North Carolina Shipbuilding Company on shipbuilding contracts for the United States Navy fitting out the interiors of liberty ships under the direction of John Sloane Griswold. In 1955, after a three-year internal struggle, control of the firm left the hands of a direct descendant of the Sloanes when Benjamin Coates, 37, was elected president. This meant the ouster of president W.E.S. Griswold, Jr. and chairman of the board John D. Sloane, both grandsons of the founders. Coates was a financier who married John D. Sloane's daughter in 1944 and served on the board. Along with the City Stores Company syndicate, he bought up 70% of the stock to win control and become head of the firm. After the store left family hands, it over-expanded and lowered the price and quality of its goods. City Stores was forced to file for bankruptcy in 1979 so that it could "continue operating while it works out a plan to pay its creditors." It was then acquired by Hollywood-based RB Furniture in 1981. The chain closed its 38th Street store in 1984, and filed for bankruptcy on September 11, 1985. Its remaining stores were sold in 1986. The company generated considerable wealth for the direct descendants of William and John Sloane, who include in addition to Rev. Coffin, diplomat Cyrus Vance, attorney Cyrus Vance, Jr., musical producer John H. Hammond, his son, musician John P. Hammond, and philanthropist Emily Thorn Vanderbilt Sloane. It also brought the Sloane family into prominence in New York City, where they intermarried with the Whitneys, the Vanderbilts, and the Pynes. Employees who worked for the firm include the American cooking icon Julia Child (then Julia McWilliams), whose first job out of Smith College in October 1935 was Assistant to the New York Advertising Manager, A. W. Forester. Other notables include the Bevelacqua brothers: Salvatore and Aurelio, who designed under the Sloane banner before their respective success in furniture design. ^ a b Barron, James (January 12, 1984). "W & J Sloane Store on 38th St. Closing". The New York Times. Retrieved 6 February 2018. ^ a b "W&J Sloane filed for protection from creditors". Los Angeles Times. 10 September 1985. Retrieved 6 February 2018. ^ "Merestead". parks.westchestergov.com. Westchester County Government. Retrieved 6 February 2018. ^ a b The Story of Sloane's. New York: W. and J. Sloane (firm). 1950. Retrieved 6 February 2018. ^ Foreman, John (6 June 2013). "BIG OLD HOUSES: We'd Call It Old Money". BIG OLD HOUSES. Retrieved 6 February 2018. ^ The Pacific Printer: The Leading Trade Journal in the West for the Printing and Allied Interests, Vol. 21-22. 1919. p. 220. Retrieved 6 February 2018. ^ Longstreth, Richard W. (1998). City Center to Regional Mall: Architecture, the Automobile, and Retailing in Los Angeles, 1920-1950. MIT Press. ISBN 9780262621250. Retrieved 6 February 2018. ^ Watts, Jennifer A. (2012). Maynard L. Parker: Modern Photography and the American Dream. Yale University Press. p. 71. ISBN 0300171153. Retrieved 6 February 2018. ^ "PERSONNEL: Changes of the Week". TIME. June 6, 1955. Retrieved 6 February 2018. ^ a b Barmash, Isadore (28 July 1979). "Owner of W. & J. Sloane Submits Bankruptcy Petitions". The New York Times. Retrieved 6 February 2018. ^ "W&J Sloane has been put up for sale after..." UPI. June 17, 1981. Retrieved 6 February 2018. ^ "Sloane Furniture Firm Files For Chapter 11". Chicago Tribune. September 19, 1985. Retrieved 6 February 2018. ^ "RB is selling its remaining W&J Sloane stores". Los Angeles Times. 5 November 1986. Retrieved 6 February 2018. ^ "Thursday Night Hikes: Irvine/Cherokee Park Hike Architecture Notes, Part 1". www.angelfire.com. Retrieved 6 February 2018. ^ Shapiro, Laura (2007). Julia Child. Penguin. p. 5. ISBN 9780670038398. Retrieved 6 February 2018. ^ "Fine Furniture" (PDF). grpl.org. August 1936. Retrieved 6 February 2018. This page was last edited on 22 July 2018, at 19:42 (UTC).